Anger and sadness have spread throughout America in the wake of Donald Trump winning the presidential election, but now it is time to channel those emotions into positive action. The most powerful example of turning emotions into action so far was the speech the Hamilton cast prepared for Mike Pence when they discovered the vice president-elect was in the audience on Friday night. Rather than encourage booing, the cast reached out to Pence and asked him to "work on behalf of all of us." According to The Hollywood Reporter, actor Brandon Victor Dixon who delivered the speech also called for unity between Trump supporters and the rest of America. Dixon and the Hamilton cast demonstrated how to peacefully protest, and if you want to join in, then there is no better place to turn for inspiration than Hamilton lyrics to help protest Donald Trump. After news broke about the Hamilton cast's speech, Trump tweeted, "Our wonderful future V.P. Mike Pence was harassed last night at the theater by the cast of Hamilton, cameras blazing.This should not happen!" He also claimed, "The Theater must always be a safe and special place.The cast of Hamilton was very rude last night to a very good man, Mike Pence. Apologize!" However, based on the video that has circulated, what Dixon said did not seem "very rude" at all. Hamilton is an American story — one of immigrants, war, and big ideas about inclusivity and equality. Hamilton lyrics are perfect for protesting Trump because they speak to the heart of true American values: life, liberty, and justice for all. If you feel inspired in the wake of the Hamilton speech, then choose one of the lyrics below and share it on your social media accounts. Not out of anger, but so your voice can be heard and those in Washington will be reminded their duty is to all of America, not just those who support Trump. Given Trump's unfounded accusations and beliefs about immigrants, the perfect lyric to start with is the one that acts as a reminder of everything immigrants have done to build the United States. Let the world know you are not giving up. Even when the odds are not in your favor, you still have a duty to fight for what is good and right in this world. A person with no real beliefs is not one who is fit to lead. This lyric is the perfect rejoinder for those who see no point in protesting. There is no line quite as powerful as this one. It is a protest mission statement that can also double as a promise to stand against hate. Trump waivers on the issues, but those who believe in equality stand strong. This is a moment of change, and if you feel like giving up the good fight, remember this line. Protest with your ferocity, with your fearlessness, and your promise to stand up for what you believe is right. This fight is personal for women, for people of color, the LGBTQ community, immigrants, the poor, and so many other disenfranchised groups. If you do not have the luxury of staying quiet, let the world hear your voice. It is time for Washington to understand there is no more room for discrimination in America, and Angelica gets right to the point with this lyric. Hamilton is the ultimate story of a man who defied all expectations to change the world. This line should inspire you to know you can do the same thing, and you won't let someone who holds a political office stop you from believing in yourself. Be loud, and don't be ashamed of protesting a man who won by championing fear. Protesting Trump is not anti-American, and it doesn't mean you are advocating anarchy. This lyric sums up your aim for anyone on social media who doesn't understand your viewpoint: You are doing what you know to be right. A true legacy is leaving the world a better place than you found it, even if the results are not immediate in your lifetime, you never know who you will inspire. Use this one when you're feeling fiery. It is just as powerful without the profanity. Make no mistake, protesting Trump is important, and history will remember those who implemented positive change in the face of a seemingly insurmountable obstacle. 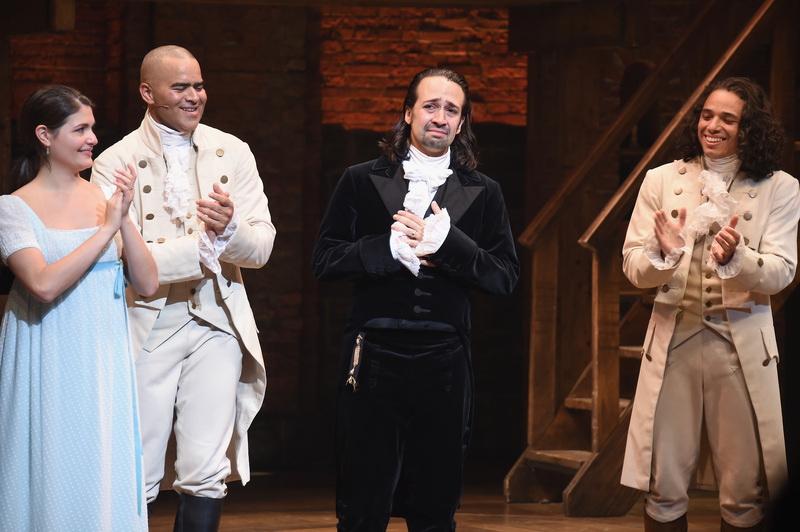 Let Hamilton help you find your voice on social media with these powerful lyrics.